You are here: Home / Recipes / Condiments / Quick & Easy Homemade Mayo! 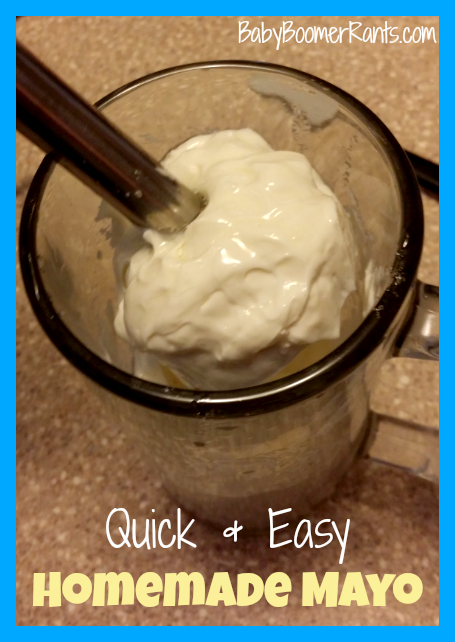 Quick & Easy Homemade Mayo! One of things I have begun to make since we started our “no sugar added” lifestyle is homemade mayo. We really love it, it’s easier, tastes great, we know what’s in it, we can add flavors to it, and make it our own blend, too. But, my most favorite thing is it’s so easy and quick! I worried when I started thinking about making it if it would be expensive buying the ingredients and if it would last or spoil quickly. Well, I found that it is VERY frugal. Since it makes up so quickly I can make it in a couple of minutes and make as large or as small a batch as I like. When I first started looking at making mayo, it was a LOOOONG process and hard. I had a little blender chopper thing with a lid, the mayo recipes all said that you had to drizzle one drop of oil at a time over quite a long time. My chopper blender thing didn’t have an opening for that, so that was almost impossible, it never came out right, and it was discouraging. I am one for just throw it all in and see what happens… so… I did! I used my immersion blender in a tall cup and threw it all in at one time and it came out great! I started off using the immersion blender and dripping the oil and I got less and less interested in waiting that long … lol. I made a video to show you how to do it so simply and easily and with just a couple of ingredients. optional: any added flavor you might like such as garlic, etc. In tall container add all ingredients. Let egg settle to the bottom for a minute or so. Set immersion blender down on top of it all, turn it on high, and hold it there about 20 seconds or so, then you can finish blending whatever oil rose up above the blender. That’s it! You’ve got Mayo! Keep it refrigerated, of course, and I have used it for up to two weeks after I made it, so it lasts a while, as well.